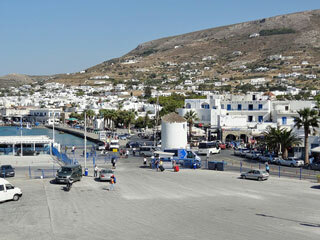 Paros is a Greek island in the central Aegean Sea. One of the Cyclades island group, it lies to the west of Naxos, from which it is separated by a channel about 8 kilometres (5 miles) wide. Historically, Paros was known for its fine white marble, which gave rise to the term "Parian" to describe marble or china of similar qualities. Today, abandoned marble quarries and mines can be found on the island, but Paros is primarily known as a popular tourist spot. This article uses material from the Wikipedia article "Paros", which is released under the Creative Commons Attribution-Share-Alike 3.0 License.